Star-crossed lovers, meddling immortals, feigned identities, battles of wits, and dire warnings: these are the stuff of fairy tale, myth, and folklore that have drawn us in for centuries. 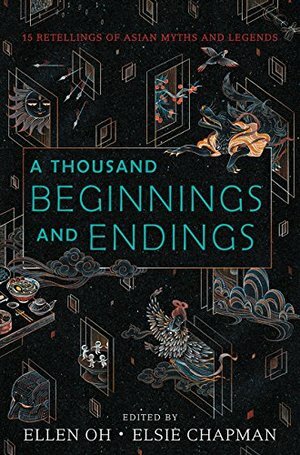 Fifteen bestselling and acclaimed authors reimagine the folklore and mythology of East and South Asia in short stories that are by turns enchanting, heartbreaking, romantic, and passionate. Compiled by We Need Diverse Books’s Ellen Oh and Elsie Chapman, the authors included in this exquisite collection are: Renée Ahdieh, Sona Charaipotra, Preeti Chhibber, Roshani Chokshi, Aliette de Bodard, Melissa de la Cruz, Julie Kagawa, Rahul Kanakia, Lori M. Lee, E. C. Myers, Cindy Pon, Aisha Saeed, Shveta Thakrar, and Alyssa Wong. A mountain loses her heart. Two sisters transform into birds to escape captivity. A young man learns the true meaning of sacrifice. A young woman takes up her mother’s mantle and leads the dead to their final resting place.From fantasy to science fiction to contemporary, from romance to tales of revenge, these stories will beguile readers from start to finish. For fans of Neil Gaiman’s Unnatural Creatures and Ameriie’s New York Times–bestselling Because You Love to Hate Me.